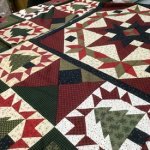 Approximately 80" x 80" The 8-month program begins early June. 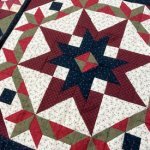 Fair Warning, this BOM will sell out very quickly! 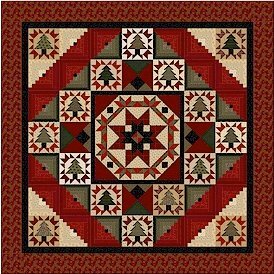 Pam Buda's beautiful new Peaceful Pines BOM is perfect for quilters who prefer a Reproduction approach to holiday quilts over traditional Christmas-theme prints. 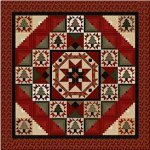 Inspired by a recent bucket-list travels to the national parks of North and South Dakota, Pam's rich reds, greens and neutrals combine to create a center medallion wreath, surrounded by Log Cabin and Pine Tree blocks.